As we come into Passion Week, we face the poignant truth of Christ’s crucifixion and our salvation. Facing this truth at times can be bewildering for the people who are ignorant of their sins or wish to spend Lent and Passion Week like they always do, for who likes facing their weaknesses? It is much easier closing our eyes on our wrongdoings than having to confess them, repent, fix, and keep the promises we have made to God. It is always easier to justify our sins, and it does feel better to grow a thick-skin to that stomach-aching feeling of guilt and remorse. I can only imagine how God must feel when we refuse to face our sins and repent. I imagine it through a human experience when one is hurt and the one who inflicts pain refuses to acknowledge what they have done. Some inflictors try to ignore the problem as long as they can, hoping time would solve it some way or the other. But the ones who’ve been hurt know– time can heal the wounds, but it cannot undo a wrong. If there is such a thing as undoing a mistake, it is by doing everything to make up for that mistake. By continuing to rebuild trust and walking the process of regaining hope with that person, is there a chance of putting back broken pieces together. Yet, so often than not, do people hope that time will cancel their wrongs- as if hoping the broken pieces magically come together was the same thing as getting the glue, sitting down, and trying to get it together. Such a childish response, I have to say. At least children put on a guilty face. What happened, happened. But what comes after makes a big difference. Apologizing and acknowledging a wrong is a start. Hopefully, the apologizing stems from a deeper conscience called guilt. Guilt recognizes that the pain inflicted on others, matters. In another words, “they” matter, not just “me”. That’s a big step. Then, what can help the healing process is fixing up. You cannot fix what has happened, but you can prevent the same mistake from happening twice. A house can be destroyed by water, but when it is rebuilt keeping in mind the weakness it had before, it can be made to withstand the next storm around. 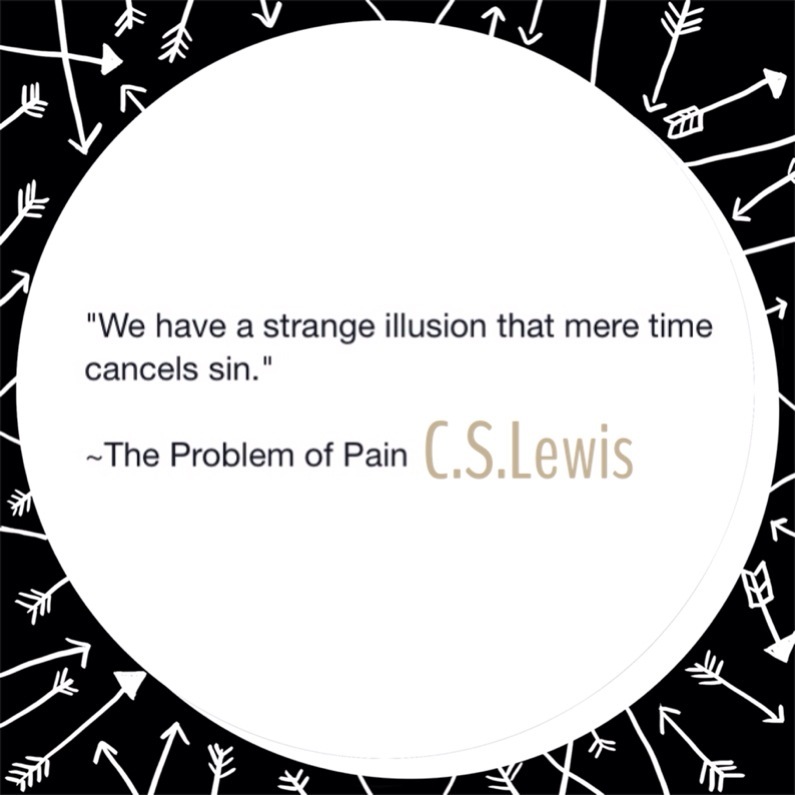 Time does not cancel our sins. It will not undo what we have already done. It will not help God forget our shame, nor will it come to pass when God somehow ignorantly finds favor in His eyes. I imagine God sitting on His throne, looking down at each of us, His sight piercing right through our stubborn brick souls. God is a loving God, and He is waiting to forgive us- but do we seek it? Though man has his whole lifetime to learn how to forgive, God forgives at the blink of an eye. He gives without remembering our past. Though between a man and a man, it requires a constant and proving to rebuild trust- between God and man, it is a different story. The Bible teaches us about God’s grace, that ultimate grace that no man can give. Isaiah 43:25-26 “I, even I, am he who blots out your transgressions, for my own sake, and remembers your sins no more. Review the past for me, let us argue the matter together; state the case for your innocence. Isaiah 1:18 “Come now, let us reason together,” says the LORD. “Though your sins are like scarlet, they shall be as white as snow; though they are red as crimson, they shall be like wool. This Lent season, why not take time to reflect yourself through the Bible? Though man cannot make us anew, nor self nor any other worldly teaching, the Lord can and will. He will wipe our sins like snow, and He will remember them no more. The only truly healing comes through repentance, and only by rebuilding your relationship with God can you find true peace in your life. This entry was posted in Discussions and tagged bible, christ, christian, christianity, easter, faith, God, Jesus, lent, passion week, religion, repentance. ← Talent: nature or nurture? Reblogged this on God's Promise.